What is Quality Inspection Services? Quality inspection are measures aimed at checking, measuring, or testing of one or more product characteristics and to relate the results to the requirements to confirm compliance. This task is usually performed by specialized personnel and does not fall within the responsibility of production workers. A third party inspection service (TPI) is a business organization which will be not involved in any activities other than inspection and laboratory testings, all companies and parties such as buyers, sellers, engineering companies, logistics forwarders, plant owners are all have access to these agencies and use their services. The confidentiality, independence, impartiality and integrity are the most important conditions for being a Third Party Inspection Service Company. In a quality inspection, a third party inspection company will send inspector to supplier’s facilities, performed the different type of inspection based on standard. Why should you conduct third party quality inspection? Reduce customer issues and complaints. Please download Inspection Report Sample here for reference and better understand the third party inspection services. How many types of inspection services do you know? Generally there are five types of quality inspection services and each one corresponds to a particular step in the production process. They are all part of the useful tools for every importer, when it comes to from China or Asia. Below we would like to summarize the options available to anyone would like to know, as in a visual manner. Will attests that all engineering, design and specification requirements are rightly understood, accounted for, verified, and recorded. PPI tells the buyer which kind of raw materials (or components) will be used on product. Factories are often suspected of lowering their costs by purchasing substandard materials, and this can be disastrous for the buyer (e.g. the wrong kind of chip in an electronic device but you can’t see by visual). The pre-production inspection also focus on the processes followed as production starts. Sometimes this can also be critical if the factory not respect your approved samples or specification of pattern. DPI allows the buyer to have an idea of average product quality, early in the production cycle. It is the most useful and the most under-rated tool at the disposal of importers, who often only rely on final inspections. It usually takes place at factory once about 20%-50% finished products have come out of the lines. If quality issues are found, what is already produced might be re-workable, and corrective actions can be taken for the rest of the job. It gives buyers the time to plan ahead, and even to avoid delays (repairs and re-inspections take much more time when problems are noticed after all production is finished. You can all PSI as Final Random Inspection too, by far it’s the most common type of quality inspection services. It takes place once 100% of shipment quantity is finished and at least 80% is packed, so it can be a real random inspection (this is not exactly the case if quality is checked earlier) and suppliers cannot play games. It puts pressure on suppliers and gives power to buyers. Its objective is really to confirm a shipment’s quality, rather than catching issues early. clients always will be advised to complement final inspections with a DUPRO, to avoid finding disasters at the last minute. (Also called Container loading inspection) Ensures that the correct styles, sizes and quantities have been loaded correctly and safely onto the container. It happens in the manufacturer’s warehouse or the forwarder’s premises, Not only the loading of the correct products and its quantity are supervised during the supervision but also the correct packaging and the quality of the goods are inspected. Actually some clients will choose another services: Defects Sorting Service (DSS), it always conducted when issue was discovered and defective products need to be separated from acceptable ones. especially the products selling by B2C or E-commerce Platform like Amazon, Wish or Shopify etc. More: When you need a Full Inspection Service(100% Defect Sorting Service)? 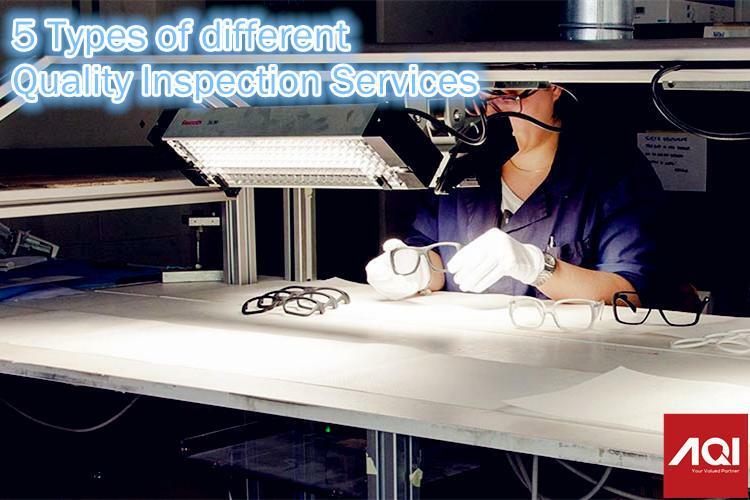 That’s the 5 types of inspection services in quality control, seldom projects require all types of inspection. Generally, only one or two of these tools are used, depending on the risks identified by the buyer.